There’s something so special about a homemade birthday party. 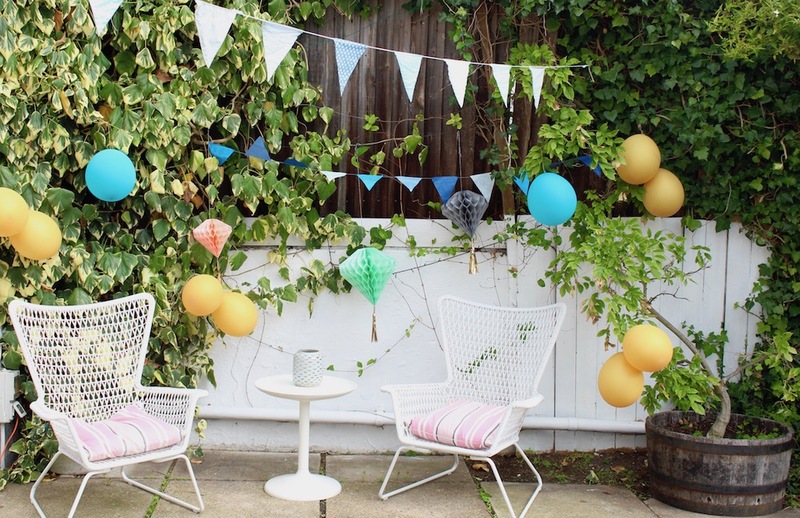 I love setting up the decorations, blowing balloons and organising party games. It always gives me such a lovely feeling of nostalgia. We just celebrated Sophie’s birthday in our new home surrounded by her classmates, all 25 of them! 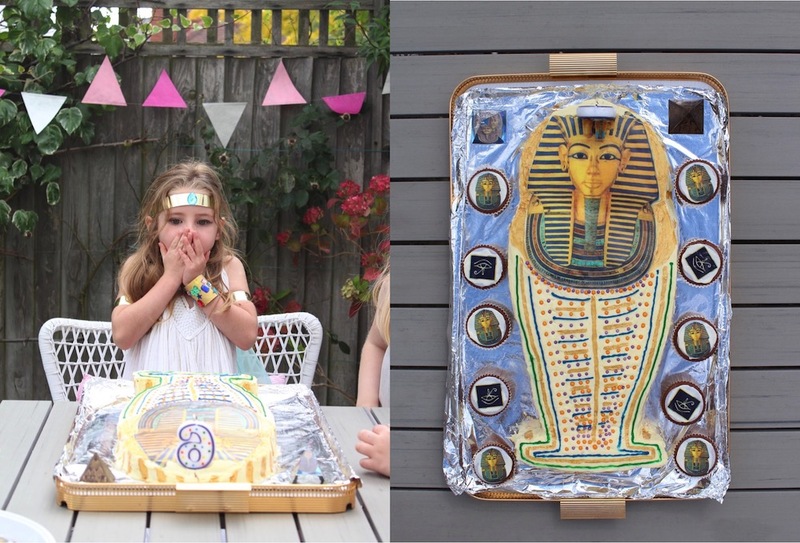 I’m still recovering from that but I thought I’d share with you one of our all time favourite themed parties from a few years back – Sophie’s Ancient Egyptian birthday party. Somehow we always strike it lucky with the weather in September but each of the games involved here can also be carried out indoors. 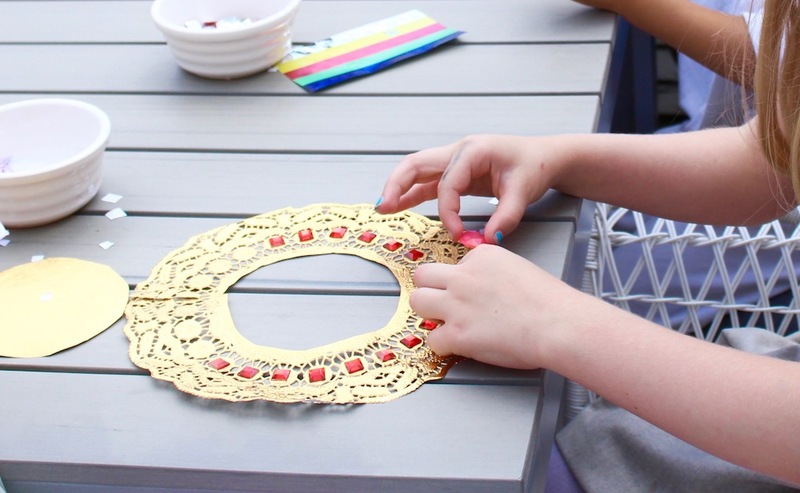 In fact even if you don’t have the excuse of a party these fun crafts make perfect rainy day activities too. 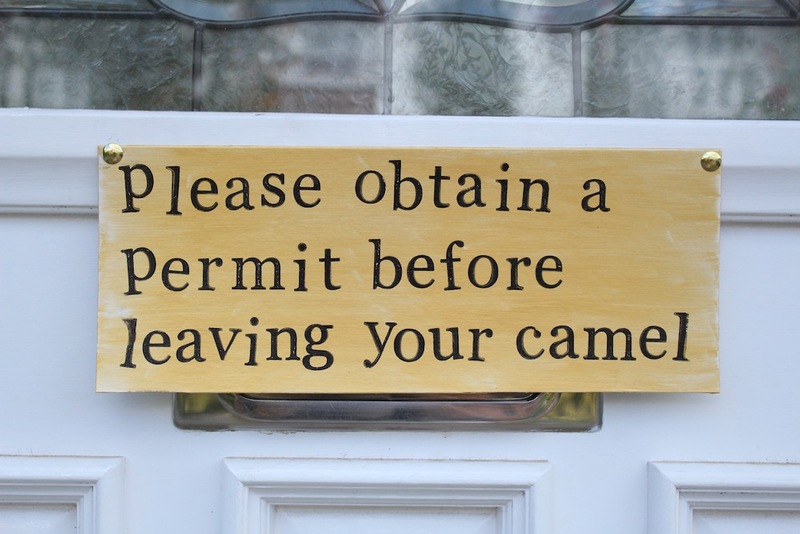 You will need; Gold paper doilies, sticky backed gemstones, colourful shape stickers, cardboard toilet roll tubes and gold paint. Prepare the Egyptian collars by cutting a slit into one side of the doily then cut a neck sized circle out of the centre. 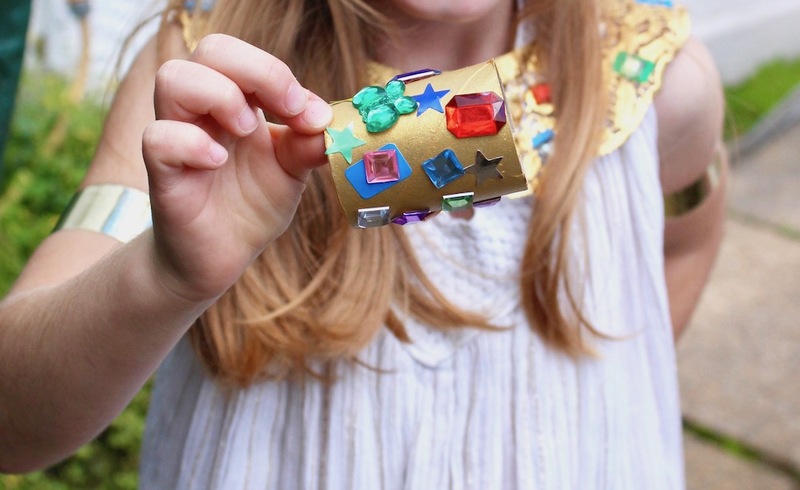 Let the kids go to town covering the collar with stickers and jewels, the brighter the better. It’s so simple that even younger kids can get involved and the results are amazing. For the cuffs cut a standard toilet roll tube into two equal pieces then cut a slit down one side. 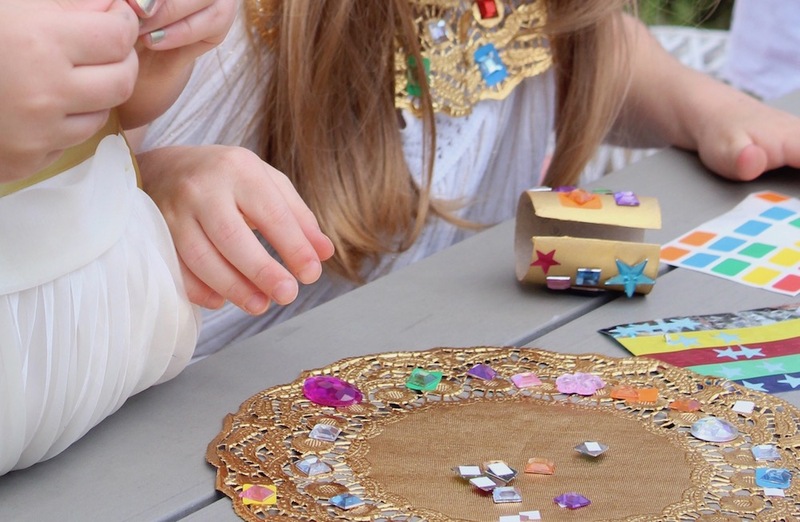 Paint with gold paint, leave to dry and cover with more colourful gems. We also printed out some fantastic colouring in pharaoh headpieces onto plain card. You can download the free template here. I was so pleased to see all the kids really enjoying these activities. I think they found the sparkly gems irresistible and it provided a lovely calm start to the party. If you’ve never heard of the Mummy Game then I urge you to try this with your kids. It is easily the most fun you can have with a toilet roll and leaves even the most sensible of our friends in fits of giggles. Split into teams, three people per team works well. 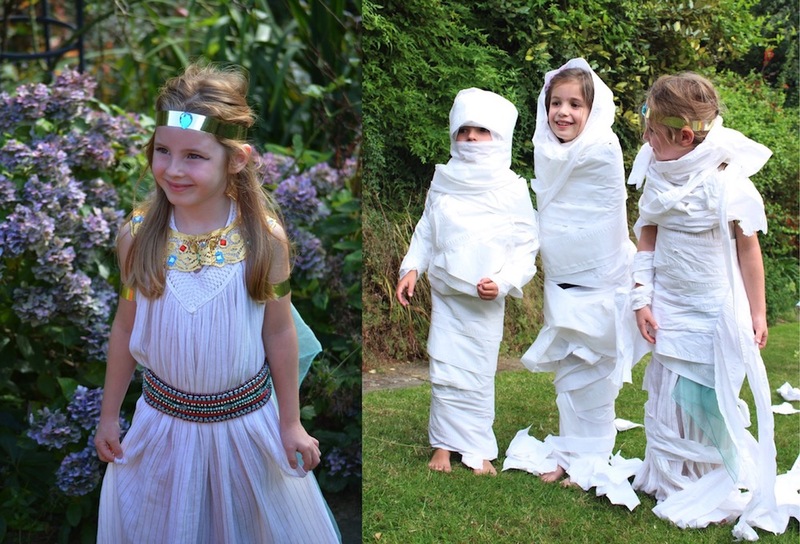 Nominate one person to be the mummy and the rest as bandage wrappers. Each group are given two toilet rolls and three minutes to wrap their mummy from head to toe. At the end of the three minutes each mummy is made to run around the garden or room. The mummy with the most bandages left in tact is the winner. You’ll be picking up toilet paper for days after but I promise this game is always a huge hit with kids! 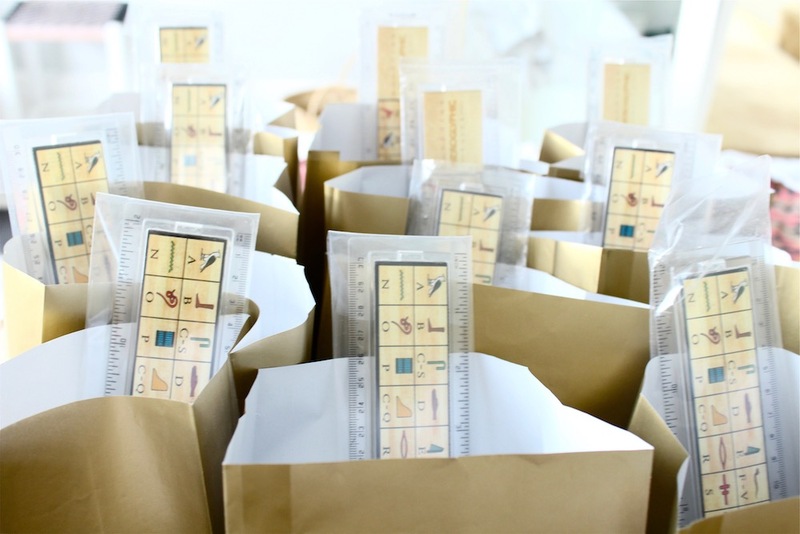 For going home gifts I filled simple gold paper bags with these excellent hieroglyphic alphabet rulers from the British Museum, a gold balloon and Egyptian colouring pencil tubes. What an imagination you have! Such a cool and creative party! What a lucky birthday girl. OH WOW! This is such a fabulous party! I love the cake and the craft is genius! Hi Kate, love the party idea, I think this will be perfect for my daughter’s next party! On a side note, I love the white mesh outdoor chairs in the top photo, would you kindly advise where they are from?